For the comic series, see Grimm Fairy Tales (comics). Not to be confused with Grimm Tales (disambiguation) or Grimm's Fairy Tale Classics. Grimms' Fairy Tales, originally known as the Children's and Household Tales (German: Kinder- und Hausmärchen, pronounced [ˌkɪndɐ ʔʊnt ˈhaʊsmɛːɐ̯çən]), is a collection of fairy tales by the Grimm brothers or "Brothers Grimm", Jakob and Wilhelm, first published on 20 December 1812. The first edition contained 86 stories, and by the seventh edition in 1857, had 211 unique fairy tales. 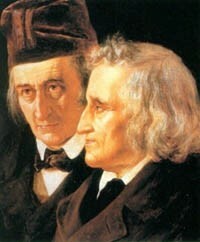 Jacob and Wilhelm Grimm were two of nine children from their mother Dorothea (Née Zimmer) and father Philipp Wilhelm Grimm. Philipp was a highly regarded district magistrate in Steinau, near Kassel. Jacob and Wilhelm were sent to school for a classical education once they were of age, while their father was working. They were very hard-working pupils throughout their education. They followed their father’s footsteps and started to pursue a degree in law. However, in 1796, their father died at the age of 44 from pneumonia. This was a tragic time for the Grimms because the family lost all financial support and relied on their aunt, Henriette Zimmer, and grandfather, Johanne Hermann Zimmer. At the age of 11, Jacob was compelled to be head of the household and provide for his family. After down-sizing their home because of financial reasons, Henriette sent Jacob and Wilhelm to study at the prestigious high school, Lyzeum, in Kassel. In school, their grandfather wrote to them saying that because of their current situation, they needed to apply themselves industriously to secure their future welfare. Shortly after attending Lyzeum, their grandfather died and they were again left to themselves to support their family in the future. The two became intent on becoming the best students at Lyzeum, since they wanted to live up to their deceased father. They studied more than twelve hours a day and established similar work habits. They also shared the same bed and room at school. After four years of rigorous schooling, Jacob graduated head of his class in 1802. Wilhelm contracted asthma and scarlet fever, which delayed his graduation by one year although he was also head of his class. Both were given special dispensations for studying law at the University of Marburg. They particularly needed this dispensation because their social standing at the time was not high enough to have normal admittance. University of Marburg was a small, 200-person university where most students were more interested in activities than schooling. Most of the students received stipends even though they were the richest in the state. The Grimms did not receive any stipends because of their social standing; however, they were not upset by it since it kept the distractions away. Jacob attended the university first and showed proof of his hard work ethic and quick intelligence. Wilhelm joined Jacob at the university, and Jacob drew the attention of Professor Friedrich Carl von Savigny, founder of its historical school of law. He became a huge personal and professional influence on the brothers. Throughout their time at university, the brothers became quite close with Savigny and were able to use his personal library as they became very interested in German law, history, and folklore. Savigny asked Jacob to join him in Paris as an assistant and Jacob went with him for a year. While he was gone, Wilhelm became very interested in German literature and started collecting books. Once Jacob returned to Kassel in 1806, he decided to quit studying law and instead spent his full efforts on German literature. 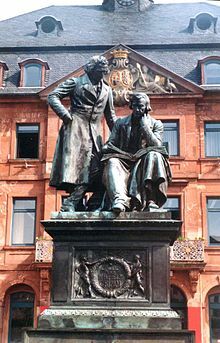 While Jacob studied literature and took care of their siblings, Wilhelm received his degree in law at Marburg. During the Napoleonic Wars, Jacob interrupted his studies to serve the Hessian War Commission. In 1808, their mother died and it was hard on Jacob because he took the position in the family as a father figure, while also trying to be a brother. From 1806 to 1810, the Grimm family had barely enough money to properly feed and clothe themselves. During this time, Jacob and Wilhelm were concerned about the stability of the family. Achim von Arnim and Clemens Brentano were good friends of the brothers and wanted to publish folk tales, so they asked the brothers to collect oral tales for publication. The Grimms collected many old books and asked friends and acquaintances in Kassel to tell tales and to gather stories from others. Jacob and Wilhelm sought to collect these stories in order to write a history of old German Poesie and to preserve history. The first volume of the first edition was published in 1812, containing 86 stories; the second volume of 70 stories followed in 1815. For the second edition, two volumes were issued in 1819 and a third in 1822, totaling 170 tales. The third edition appeared in 1837; fourth edition, 1840; fifth edition, 1843; sixth edition, 1850; seventh edition, 1857. Stories were added, and also subtracted, from one edition to the next, until the seventh held 211 tales. All editions were extensively illustrated, first by Philipp Grot Johann and, after his death in 1892, by German illustrator Robert Leinweber. The first volumes were much criticized because, although they were called "Children's Tales", they were not regarded as suitable for children, both for the scholarly information included and the subject matter. Many changes through the editions – such as turning the wicked mother of the first edition in Snow White and Hansel and Gretel (shown in original Grimm stories as Hänsel and Grethel) to a stepmother, were probably made with an eye to such suitability. Jack Zipes believes that the Grimms made the change in later editions because they “held motherhood sacred”. They removed sexual references—such as Rapunzel's innocently asking why her dress was getting tight around her belly, and thus naively revealing to the witch Dame Gothel her pregnancy and the prince's visits—but, in many respects, violence, particularly when punishing villains, was increased. The brothers' initial intention of their first book, Children’s and Household Tales, was to establish a name for themselves in the world. After the first book was published in 1812, they began their second volume, German Legends, which was published in 1818. The book that started their international success was not any of their tales, but Jacob’s publication of German Grammar in 1819. This was one year after their publication of the German Legends. In 1825, the Brothers published their Kleine Ausgabe or "small edition", a selection of 50 tales designed for child readers. This children's version went through ten editions between 1825 and 1858. In 1830, Jacob became a professor at University of Göttingen and shortly after, in 1835, Wilhelm also became a professor. During these years Jacob wrote a third volume of German Grammar and Wilhelm prepared the third revision of the Children’s and Household Tales. In 1837, King Ernst August II revoked the constitution of 1833 and was attempting to restore absolutism for the Kingdom of Hannover. Since Göttingen was a part of Hannover, the brothers were expected to take an oath of allegiance. However, the brothers and five other professors led a protest against this and were heavily supported by the student body since all of these professors were well renowned. Jacob left Göttingen immediately and Wilhelm followed him a few months later back to Kassel. In Kassel, the Grimms devoted themselves to researching and studying. 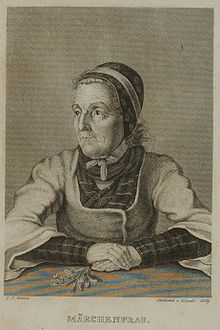 A close friend of theirs, Bettina von Arnim, was also a talented writer. Savigny and others convinced the King of Prussia, Friedrich Wilhelm IV, to allow the brothers to teach and conduct research at the University of Berlin. In March 1841, the brothers did just this and also continued to work on the German Dictionary. 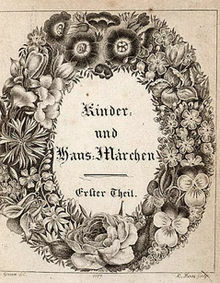 Kinder- und Hausmärchen (Children and Household Tales) is listed by UNESCO in its Memory of the World Registry. The Grimms believed that the most natural and pure forms of culture were linguistic and based in history. The work of the Brothers Grimm influenced other collectors, both inspiring them to collect tales and leading them to similarly believe, in a spirit of romantic nationalism, that the fairy tales of a country were particularly representative of it, to the neglect of cross-cultural influence. Among those influenced were the Russian Alexander Afanasyev, the Norwegians Peter Christen Asbjørnsen and Jørgen Moe, the English Joseph Jacobs, and Jeremiah Curtin, an American who collected Irish tales. There was not always a pleased reaction to their collection. Joseph Jacobs was in part inspired by his complaint that English children did not read English fairy tales; in his own words, "What Perrault began, the Grimms completed". W. H. Auden praised the collection during World War II as one of the founding works of Western culture. The tales themselves have been put to many uses. Hitler praised them as folkish tales showing children with sound racial instincts seeking racially pure marriage partners, and so strongly that the Allied forces warned against them; for instance, Cinderella with the heroine as racially pure, the stepmother as an alien, and the prince with an unspoiled instinct being able to distinguish. Writers who have written about the Holocaust have combined the tales with their memoirs, as Jane Yolen in her Briar Rose. 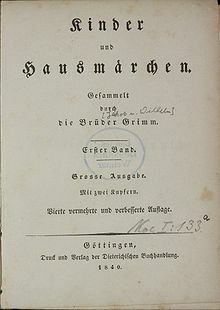 Three individual works of Wilhelm Grimm include Altdänische Heldenlieder, Balladen und Märchen ('Old Danish Heroic Songs, Ballads, and Folktales') in 1811, Über deutsche Runen ('On German Runes') in 1821, and Die deutsche Heldensage ('The German Heroic Saga') in 1829. The Grimm anthology has been a source of inspiration for artists and composers. Arthur Rackham, Walter Crane and Rie Cramer are among the artists who have created illustrations based on the stories. Key translations into English include the following. The following translations are based on Jacob Grimm and Wilhelm Grimm, Kinder- und Hausmärchen, 1st edn (1812). Grimm, Jacob; Grimm, Wilhelm (2014). Zipes, Jack, ed. The Original Folk and Fairy Tales of the Brothers Grimm: the complete first edition. Princeton: Princeton University Press. ISBN 9780691160597. Loo, Oliver (2014). The Original 1812 Grimm Fairy Tales. A New Translation of the 1812 First Edition Kinder- und Hausmärchen Collected through the Brothers Grimm. I (200 Year Anniversary ed.). ISBN 9781312419049. The following translations are based on Jacob Grimm and Wilhelm Grimm, Kinder- und Hausmärchen, 7th edn (Berlin: Duncker, 1857). Reprinted as Grimm Brothers; Margarete Hunt (Translator) (1944). The Complete Grimm's Fairy Tales. New York: Pantheon Books. ISBN 0394494156. The code "KHM" stands for Kinder- und Hausmärchen. The titles are those as of 1857. Some titles in 1812 were different. All editions from 1812 until 1857 split the stories into two volumes. ^ a b c d e Zipes, Jack, (2002). The Brothers Grimm : from enchanted forests to the modern world. Houndmills, Basingstoke, Hampshire: Palgrave Macmillan. ISBN 0312293801. OCLC 49698876. ^ 1937-, Zipes, Jack, (2002). The Brothers Grimm : from enchanted forests to the modern world. Houndmills, Basingstoke, Hampshire: Palgrave Macmillan. ISBN 0312293801. OCLC 49698876. ^ For a fuller list of nineteenth-century translations, see D. L. Ashliman, '[https://www.pitt.edu/~dash/grimm-engl.html Grimms' Fairy Tales in English: An Internet Bibliography' (2012-17). ^ See II p. 583. ^ Jacob and Wilhelm Grimm, Selected Tales, trans. by David Luke, Gilbert McKay and Philip Schofield (London: Penguin, 1982), p. 43. ^ Maria Tatar, The Hard Facts of the Grimms' Fairy Tales (Princeton, NJ: Princeton University Press, 1987), pp. xxii, 238 n. 22. ^ See p. 41 for details of the edition used. Wikimedia Commons has media related to Grimm's Fairy Tales. The Original 1812 Grimm A web site for the Original 1812 Kinder und Hausmärchen featuring references and other useful information related to the 1812 book in English.